It’s not like I am saving my best for the last. It’s just that there are so many embroidery styles I keep discovering, one post does not and cannot do justice. And each style has its own story to tell. And what is discovered must not be ignored, it must be shared right? 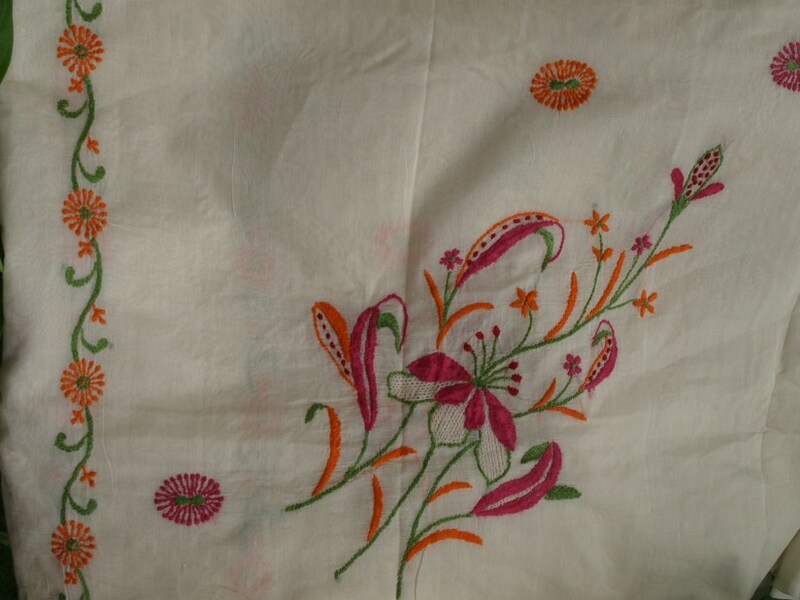 Here’s something from the Chikankari chest of treasures. In this post, which I cannot promise will be the last in the E for Embroidery series, I will share two exciting stories related to Chikankari. Chikankari or commonly called ‘chikan’ is one of the most ubiquitous forms of embroidery seen on all types of Indian garments and not just sarees. I was personally excited about finding the meaning of the word ‘chikan’. I was wondering whether it would have something to do with the bird – but no, it did not turn out that way. 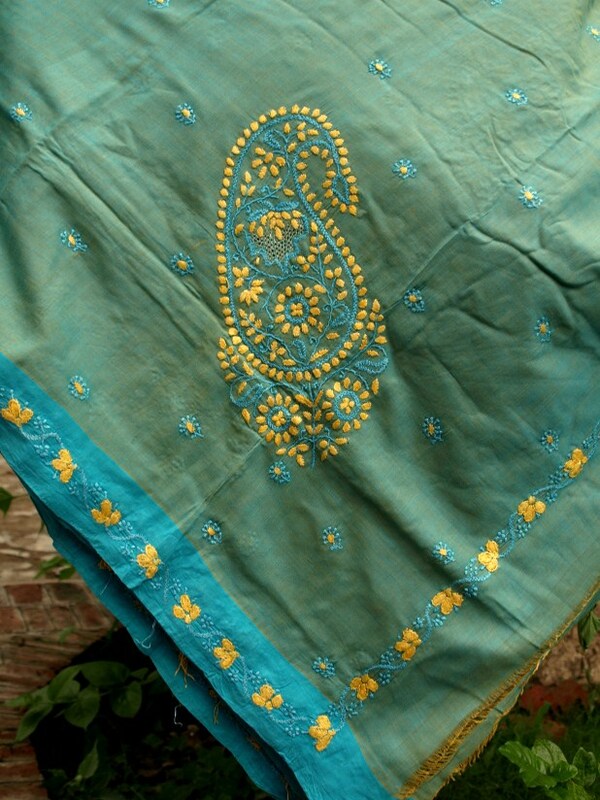 ‘Chikan’ or ‘Chikeen’ is the Persian word for, well, embroidery or cloth filled with needle work. It was Empress Noor Jehan who first brought this art to our country. Synonymous with Lucknow and also called Lucknowi, Chikankari is an art form that finds patronage amongst both women and men. I was lucky to find not one, but two stories related to the origin of Chikankari in India. Here’s the first. The first story, mostly a tale passed down through the ages, speaks of a poor traveler was passing through a village near Lucknow in the summer. The traveler asked a poor peasant for some water. The peasant felt sorry for the traveler and offered him some milk and invited him to rest in the shade of his home. The traveler was so pleased with the hospitality that he promised to teach him an art which would never allow him to go hungry. The traveler trained the peasant in the art of Chikankari. After he mastered the art, the traveler disappeared. And that’s how Chikankari arrived in India. This story rests on the belief that Chikankari was introduced in Lucknow in the 19th century through the court of Oundh. The Nawab of Oundh had a very large harem. A princess from the household of Murshidabad was married to the Nawab. She was a skilled seamstress and to escape from the boredom of the harem, she started embroidering a cap for the Nawab. She worked on it with rich white cotton threads on muslin cloth. She presented this gift to the Nawab personally. The Nawab was charmed by the gift that he started giving the princess extra attention. Seeing this, the other women in the harem got extremely jealous. So they too started embroidering different items of clothing. Soon they started making newer and different types of fine and delicate stitches. And thus was born a great work of art. 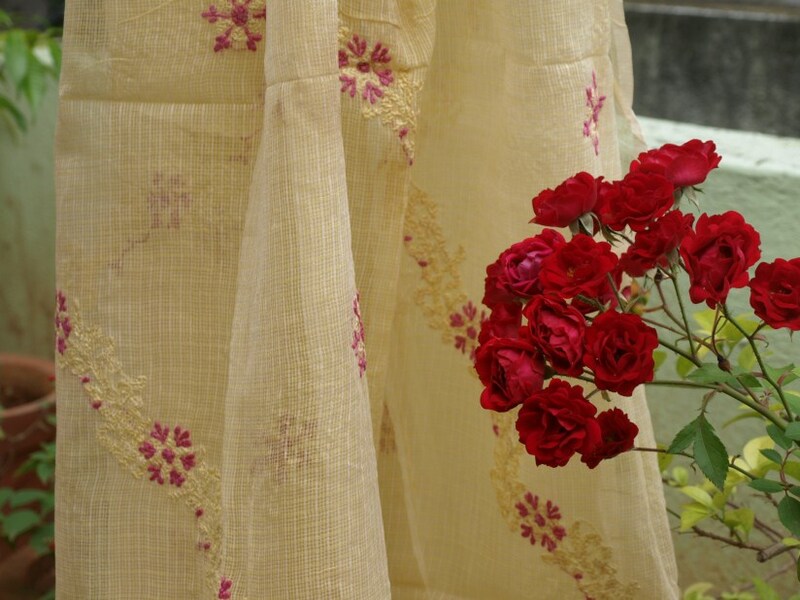 Traditionally, Chikankari was done on the purest, whitest Cottons and Muls. Something distinctive, elegant and highly aesthetic about white embroidery on white fabric caught the favour of royalty. Today Chikanakari is found on all colours and all types of fabrics and to me it is just as beautiful. I find it interesting that designers are encouraging the experimentation of using Chikankari on sarees like the Maheshwaris and Mangalgiris. The coming together of different styles certainly adds to the merriment. Even though a lot of Chikankari available today is machine-made, hand-made work is also easily available. Because of its popularity, it has managed to survive the onslaught of machine looms. This craft does not face threats of non-availability of ‘kaarigars’ or a narrowing of markets like some other embroidery. 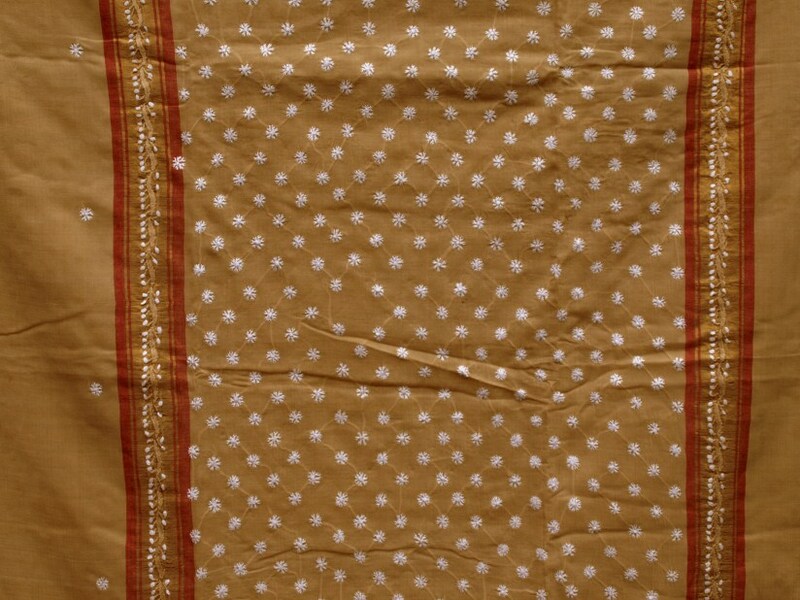 Chikankari boasts of a variety of stitches. Wikipedia lists 37 types of stitches. I possibly cannot bring images of each type, but I am definitely going to try. Meanwhile, it would be interesting for some to read the names. Some do reveal a lot about the stitch just by the way they are named. For example Ghass ki patti or Kapkapi. They are: Tepchi, Bakhiya, Hool, Zanzeera, Rahet, Banarsi, Khatau, Phanda, Murri, Jali, Turpai, Darzdari, Pechani, Bijli, Ghaspatti, Makra, Kauri, Hathkadi, Banjkali, Sazi, Karan, Kapkapi, Madrazi, Bulbul-chasm, Taj Mahal, Janjeera, Kangan, Dhania-patti, Rozan, Meharki, Chanapatti, Baalda, Jora, Keel kangan, Bulbul, Sidhaul and Ghas ki patti. Whew! Before I conclude, time to say a big thanks to my friend for the stories on Chikankari from her notes when she studied textile design in J. J. School of Arts. As I sign off, I am unsure what to bring you next week – E, F, A or B. Who knows? It’s good to go with the flow sometimes. 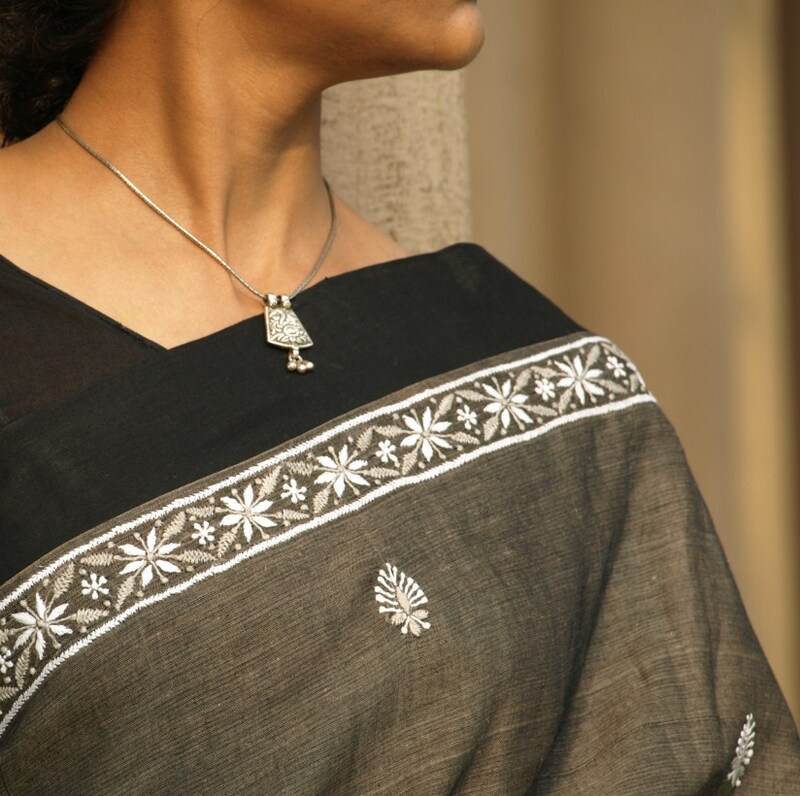 Till then, wear Chikankari and keep summer at bay! From one lover of sarees to another…Great job Punam!